This year the NCAA 2018 Division III Swimming and Diving Championship meet was hosted in Indianapolis at the famed Indiana University-Purdue University of Indianapolis (IUPUI) Natatorium. Making her second straight appearance at the national meet, sophomore Mara Selznick was invited to represent Whitman College. At the 2018 Championship meet, Selznick qualified for the 100-yard backstroke, as well as accepting her optional swims in the 200 individual medley and 100 butterfly. Overall Selznick was ecstatic to say the least when she found out she qualified. Head Coach Jennifer Blomme and Mara Selznick (‘20) enjoyed their time at the Swim- ming National Championships in Indianapolis. “I was right on the edge of not qualifying and due to the early date of our conference compared to the rest of the country, I had to wait around three weeks to find out whether I was going or not. So qualifying twentieth out of the 24 people invited was a moment of relief. I was very grateful to finally know I was going for sure and it energized me for the final stretch of training leading up to the meet,” Selznick explained. 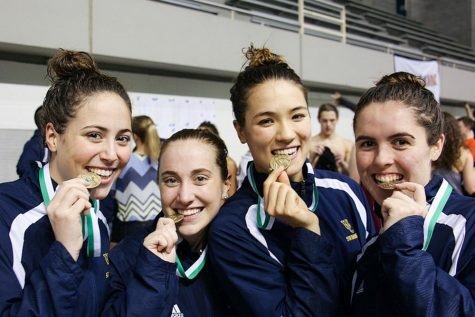 The NCAA Division III Swimming and Diving Championship meet is every Division III swimmer’s dream, however, the road to get there is not so easy especially once you are actually invited. It is an honor to participate in the Championship, but the preparation game is a different story. Training tactics, mindsets, motivation, all of these things change. For Selznick she went from training in a team setting to training alone, and had to completely shift her mindset to accommodate for all of these changes. “Training individually or in a small group allows so much one on one time with the coaches to focus on your technique and the little details. It is one of the best parts of training for nationals, because it is a visible manifestation of all your hard work and in most cases helps you swim even faster. However, with that the mindset for Nationals is more individually focused compared to the rest of the season where it is more team and points oriented. So having to switch from being motivated and swimming for your team to swimming for yourself is a hard transition to make. 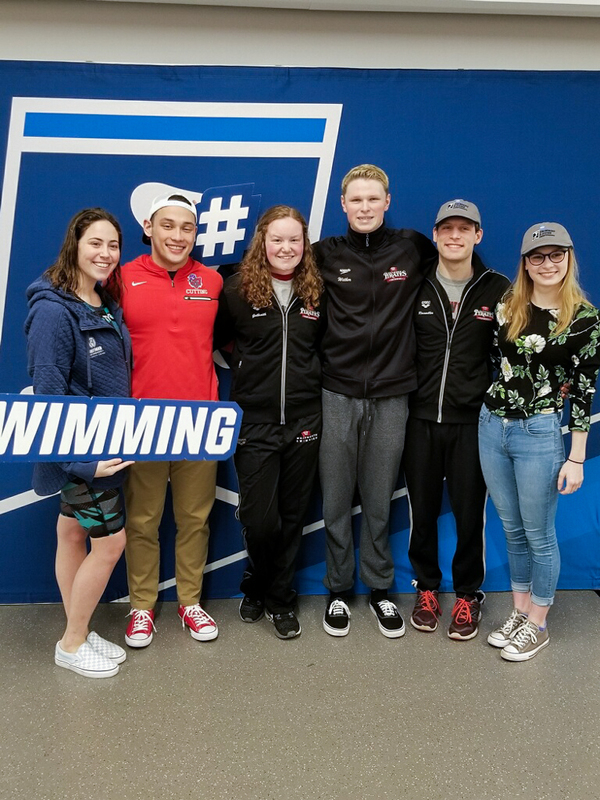 Personally, I motivate myself through the team atmosphere and swimming for the people around me but I learned a lot about who I am as an individual swimmer this nationals trip and I am very excited for my next two years on this team,” Selznick explained. In order to prepare for Indianapolis Selznick extended her stay at Whitman College to train individually over spring break with head coach Jenn Blomme and assistant coach Kevin Ewing. Days and days of individual intense training can be tough not only physically, but mentally as well. Luckily enough, Selznick’s support system grew as her teammates continuously came out to training sessions to help encourage and support her throughout this process. 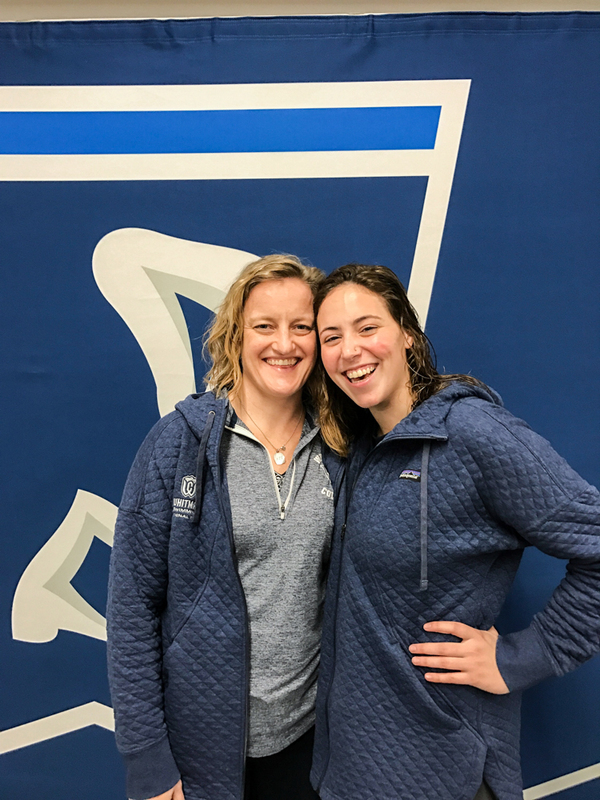 As Selznick’s training came to end she set off to travel to Indianapolis with head coach Jenn Blomme. Upon her arrival Selznick’s backstroke time of 56.31 seconds was seeded twentieth at the meet, as well as seeded forty-second in both the 200 individual medley and 100 butterfly events. With that being said, once landed in Indianapolis, Selznick was ready to hit the water. Selznick continuously improved her times over the course of the four-day championship meet. In her first swim she earned a season best time in the 200 individual medley scoring a forty-seventh place finish. Into Day Two, she shattered her personal best time in the 100 butterfly by more than two seconds earning a new career best of 57.87 seconds, the second-fastest 100 fly swim in Whitman’s program history, and finished in 35th place. Lastly, with a season best time of 55.97 seconds, Selznick finished eleventh in the 100-yard backstroke during the championship finals session, earning her honorable mention All-American certificate, as well as earning Whitman six points on the team leaderboard at the national meet. Overall, Indiana allowed Selznick to create the perfect ending to an almost perfect season.